The role-playing game sees players completing missions and collecting gear using gesture-based controls. Kabam, in collaboration with Disney Interactive and Lucasfilm, has announced the release of Star Wars: Uprising, the first mobile role-playing game set between the events of Star Wars: Episode VI Return of the Jedi and Star Wars: The Force Awakens. Star Wars: Uprising takes players to the Anoat Sector, where they’ll fight against the Empire as it attempts to retain control of the sector and prevent citizens from learning of the Emperor’s defeat. To begin, players select their hero’s gender and species (from four species options), and can further customize his or her appearance (skin tone, hair color, hair style, and so on), before giving their hero a first and last name. Once players jump into the game, they’ll complete missions (which offer multiple difficulty and reward levels) by tapping on the ground to move and tapping on enemies to auto-attack, among other gesture-based controls. Players can destroy certain objects in the environment for a chance at extra credits, the game’s free currency, and can open treasure chests for bonus loot and rewards. Players also have special skills, which can be activated by specific gestures. A double-tap, for instance, causes the character to roll away from enemies or grenades. These abilities must recharge before they’re used again. In between missions, players can equip their hero with any collected gear, and can upgrade their existing items to increase their stats. These upgrades are achieved by spending Level XP Materials, which players may collect as they complete missions. Once an item has reached its maximum level, players can spend upgrade crystals to upgrade the weapon to its next star rating (until the maximum stars are reached). This increases the weapon’s maximum level, allowing for further upgrades. As players progress, their hero will also level up, receiving rewards like maximum health boosts in the process. For social gameplay, players can add other users as friends, and chat with friends or strangers in public or private chats. As players connect with others, they can complete synchronous cooperative multiplayer missions. As the community completes special sector-wide battles (which Erickson said sees them ‘push the Empire off of a new world’), they’ll unlock new content for everyone to play. Finally, over time, players will collect new AI characters for their overall crew. These characters can be sent on timed missions, each with a specific chance of success, to retrieve specific rewards, including materials and crystals. As a white-hat free-to-play company, we pride ourselves on never having pay walls or other sorts of predatory spending schemes. Instead, we monetize for time (getting a shot at a rare loot drop without having to grind) and convenience (more inventory, etc.) Even those features, however, are available with a currency that is readily available in game with some time investment. 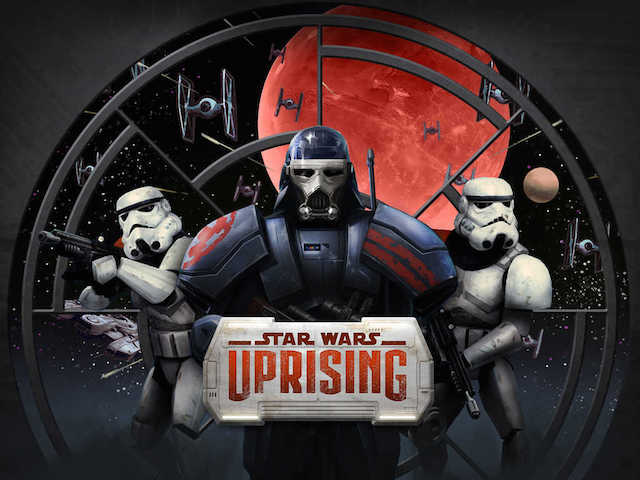 Star Wars: Uprising is available to download for free on the iTunes App Store and Google Play.